Anemia is a very common symptom of celiac disease—in one study, one-third of newly diagnosed celiacs had anemia. Why do anemia and celiac disease so often appear together? Well, it's usually because in celiac disease, you can't always absorb nutrients from your food...and when you don't get enough iron from your food, you can develop anemia. Let's review some basics of anemia. Your body uses hemoglobin—a protein found in red blood cells—to carry oxygen throughout your body. When you have anemia, you don't have enough hemoglobin, and so your cells aren't getting enough oxygen to function well. Symptoms of anemia can include shortness of breath, fatigue, weakness, dizziness, feeling cold all the time, a rapid pulse, heart palpitations, and headache. Anemia can have many different causes. The most common type of anemia—both worldwide, and in celiac disease—is known as iron-deficiency anemia. Iron is a critical component of hemoglobin, so when a person is iron-deficient, the body cannot make enough of it. People with celiac disease can also have a type of anemia called "anemia of chronic disease." This form of anemia is related to the damage in their intestines that results from eating foods that contain the protein gluten. Most people who suffer from iron-deficiency anemia have the condition due to blood loss. The cause of their blood loss may be obvious (such as with trauma or from heavy menstrual bleeding) or invisible (such as with a bleeding ulcer). A diet that's low in iron also can cause iron-deficiency anemia, as can pregnancy (which is why most obstetricians recommend extra iron). If you have iron-deficiency anemia that can't be explained by one of those issues, there's a fairly good chance you have celiac disease, even if you don't have obvious celiac symptoms. In fact, among people with iron-deficiency anemia but no digestive symptoms, up to 9% will test positive for celiac disease. If you do have digestive symptoms, you're even more likely to have celiac. That's why the American Gastroenterological Association recommends that any adult with otherwise unexplained iron-deficiency anemia be tested for celiac disease. As I said above, people with celiac disease get iron-deficiency anemia because they're not absorbing enough iron from the food they eat. That's because in celiac disease, eating gluten-containing foods causes your body to attack the lining of your small intestine, impairing your ability to absorb nutrients (including iron). In fact, there's some evidence that people who have anemia as their main celiac disease symptom actually have the more severe celiac disease than people who have diarrhea as their primary symptom. Fortunately, once you're diagnosed with celiac and start the gluten-free diet, your intestinal lining will begin to heal and you'll start to absorb nutrients from your food again. Your doctor may recommend you take iron-containing supplements to build up your iron stores and to eat foods that are rich in iron, such as red meat. 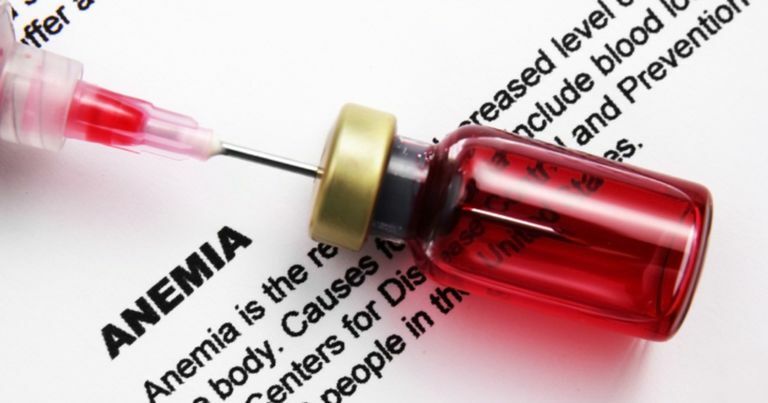 Other factors that are associated with iron-deficiency anemia caused by problems absorbing nutrients include Crohn's disease, overuse of antacids, and gastric bypass surgery. While iron-deficiency anemia is a well-known consequence of celiac disease, anemia of chronic disease also is associated with celiac. A 2006 study found that about 12% of people with the newly diagnosed celiac disease and anemia had a form known as "anemia of chronic disease." This type of anemia, sometimes also called “anemia of chronic inflammation,” is seen mostly in people who have been sick for a long time. It occurs because your immune system's response to the inflammation in your body actually interferes with your body's production of red blood cells. Because people with celiac disease who eat gluten have an intense inflammatory response in their intestines, it’s not surprising that anemia of chronic disease could develop. It's also possible to have both these forms of anemia at the same time. It's pretty easy to test for anemia—it will show up in the results of a complete blood count, or CBC, which is a very common test run by most doctors. The CBC measures the amount of hemoglobin in the blood, along with the numbers and proportions of different types of blood cells. If your blood test shows you have anemia, your doctor may recommend additional tests to find the cause. Examining your red blood cells under a microscope, and testing your iron levels, can provide additional information. Abu Daya H et al. Celiac disease patients presenting with anemia have more severe disease than those presenting with diarrhea. Clinical Gastroenterology and Hepatology.2013 Nov;11(11):1472-7. Bergamaschi G et al. Anemia of chronic disease and defective erythropoietin production in patients with celiac disease. Haematologica. 2008 Dec;93(12):1785-91. Harper JW et al. Anemia in celiac disease is multifactorial in etiology. American Journal of Hematology 82:996–1000, 2007. National Heart Lung and Blood Institute. What Is Anemia? fact sheet. Schrier SL. Iron deficiency anemia. UpToDate. Volta U et al. The changing clinical profile of celiac disease: a 15-year experience (1998-2012) in an Italian referral center. BMC Gastroenterology.2014 Nov 18;14:194.